Hi everyone, here is an update on Santa's Village, I have just finished the second cottage and have begun to stitch the next one. I have not had chance to do much stitching because I have been overseeing the craft room installation, I was hoping to have finished the third cottage by now, however, it just means I need to stitch the next one a little faster! I love the way it looks on this grey fabric, it is quite soft on the eye. My craft room is now installed, I have had a few plug sockets moved which means I need to paint over the walls in some areas, once I have done that I will be choosing new curtains and a new chair. I have organised all my craft things into their own drawers and cupboards, it is so much easier to access my things now and be able to create in this lovely room. 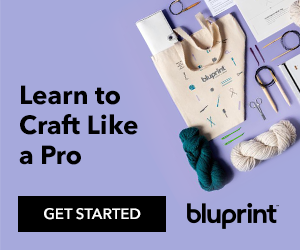 I have a number of things I am looking forward to designing over the next few weeks and then showing on my blog. When I was sorting through all of my craft room boxes I found some unfinished projects that I forgot I had, one design only needs a few more stitches and quite a bit of back stitch to finish it. The design is a Noah's Ark scene stitched on Aida over a small count so it looks quite lovely, hopefully I should be showing that soon. I also found a fully finished cross stitch that I forget to frame, it is a Mirabillia Fairy design, I can't believe I actually forgot to get it framed! Some of these projects were exchange pieces, therefore not everything in the photographs has been stitched by me, if you ever did an exchange with me you just may see it below - can you spot any of your stitching? A big welcome to all of my new followers, until next time - Happy Stitching! 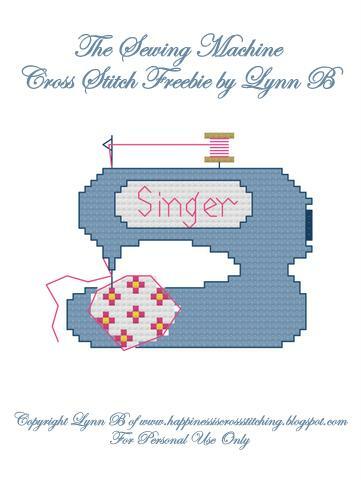 Hi everyone, its Friday Freebie today! 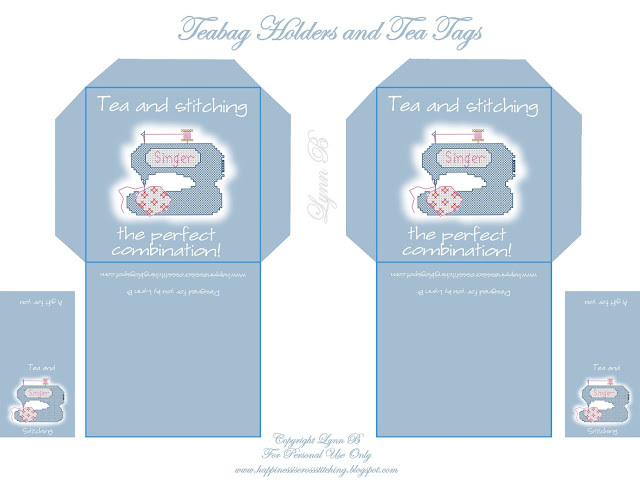 I have designed some Teabag Holders and Tea Tags to match the cross stitch freebie, gift tags and paper in the previous Freebie Friday post here, if you are ever having stitching friends around for afternoon tea they would make a lovely gift for your visitors. It was my sisters 50th birthday at the weekend, I stitched this embroidery for her, it is called Fairies Hiding and believe it or not it was a free pattern which I got from this website, I could not locate it on the site so I emailed the owner and she sent me a copy, if you email Brenda I am sure she will oblige. 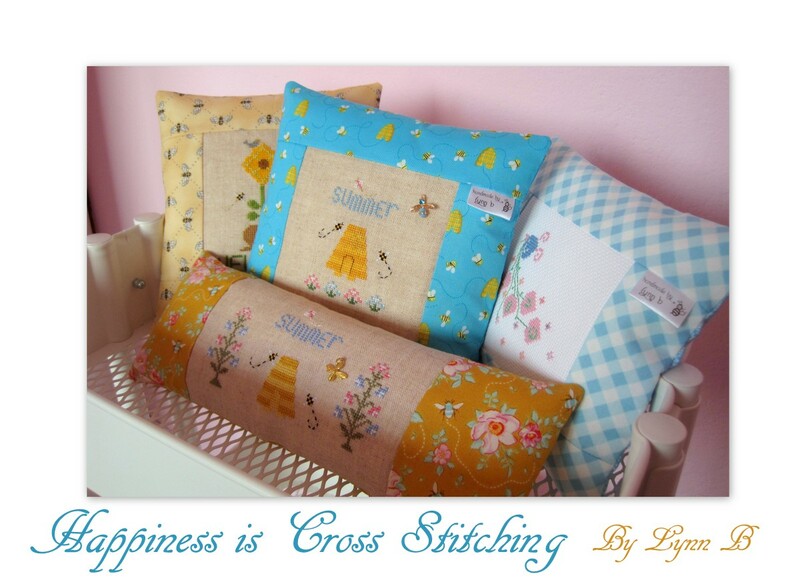 Check out her Embroideries here , there are some gorgeous designs. 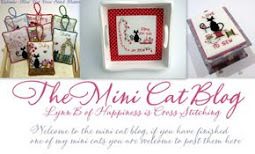 Hi everyone, I hope you are not bored with the mini cats but I have just finished another of the designs into a scissor fob, I have also printed out the free matching paper and gift tag just to see what it was like. The gift tag measure 4.5cm x 8cm and the scissor fob measures 5cm x 6.5cm. My Craft Room is painted ready for the next stage and all of my stitching news! Hi everyone, my Craft Room is freshly painted and all ready for the next stage, I love this colour, it is so soft on the eye. It was initially painted cream and white but that was only temporary until I had decided on the appropriate colour. If you like the colour and live in England it is from the 1829 range at B and Q and it is called Study Room Blue. 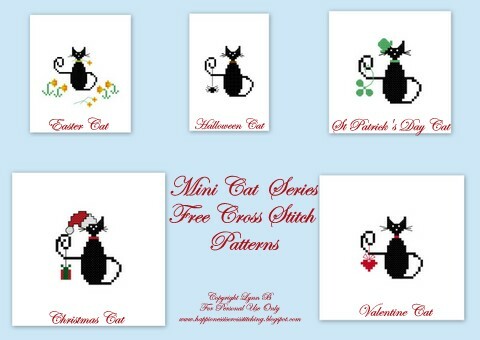 Free Easter Cat pattern from mini series of cats and matching gift tags! 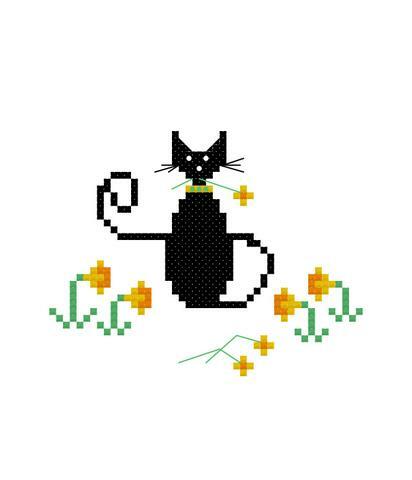 Hi everyone, I have been designing another little mini cat pattern from my small series of free cross stitch cat patterns, this time it is an Easter freebie. 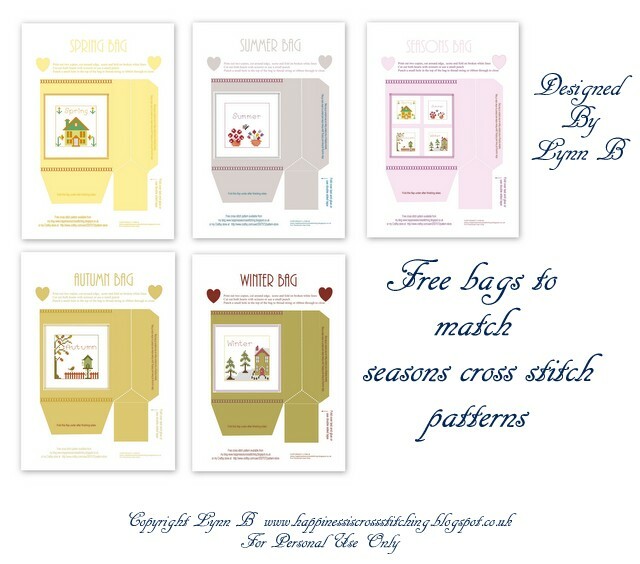 All these patterns are available from the link at the top of this page in my Free Patterns tab, although the Easter freebie is below, just right click on the cross stitch grid and click 'save as' and you are ok to go! Edited: I forgot to add the matching gift tags for the Easter Cat, see below! 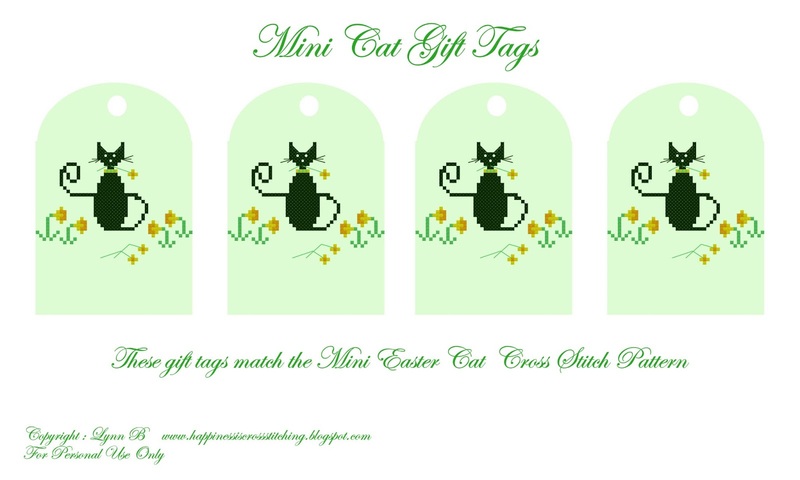 My husband bought me Photoshop Elements 11 for Christmas and these Easter Cat Gift Tags are some of my first designs using that programme. My husband is currently painting the craft room in a gorgeous colour, I will show a photo soon. Here are the free matching gift tags for the Easter Cat. Just right click on the picture and click 'save as' to your computer. Until next time - Happy Stitching! 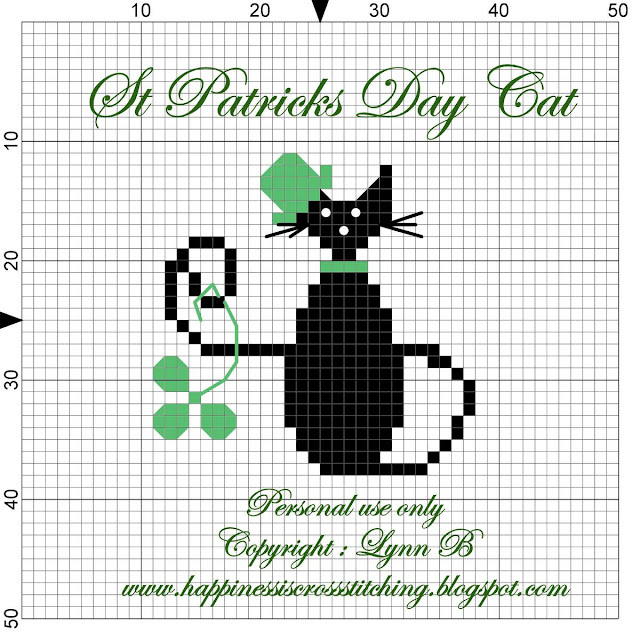 Hi everyone, I don't usually post on a Friday but I was inspired by one of my readers to create this St Patrick's Day Cat Cross Stitch Pattern to commemorate St Patrick's Day on the 17th March 2013, its a freebie from my small cat designs, I hope you like it! 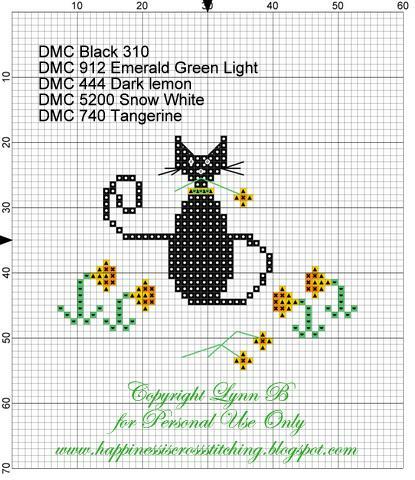 The green thread is DMC 912 and the black is DMC 310, although you can choose any colour of green that you desire.